I do realize that a blue-haired gremlin is less of a shock in LEGO than in real life, but imagine being shocked by Eddy the Electrical Gremlin, both literally and figuratively. The feeling would probably be as funny as this little blue guy we are looking at here. The closest a person has gotten to being shocked by Eddy is Logey Bear, his builder, so if you are curious about it, direct your questions to Logey. The build is oozing with character, which is very well established as a mischievous little monster by his psychotic yellow eyes. 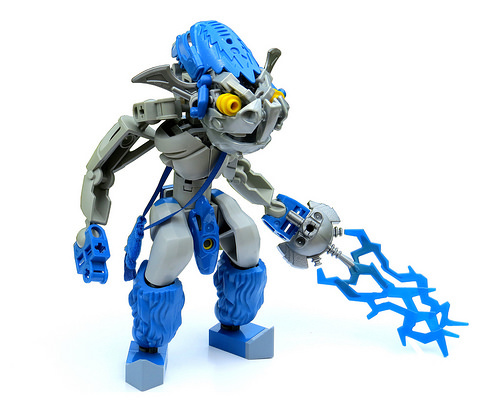 There is a lot of unique parts usage as well, such as the Hero Factory head piece as hair, Galidor limbs and troll arms for legs and a Scala purse used for its intended purpose. The figure’s posing is very expressive too, Eddy looks just like he might vandalize something right now.